By Wanted, Feorela is an unraced half-sister to stakes performer Extend (Catbird). She is out of the Caerleon mare, Calamera who is three-quarter-sister to DAYMARTI, half-sister to DALTAWA (dam of DALAKHANI, DAYLAMI, DALGHAR). This is a rare chance to access one of the worlds best families! 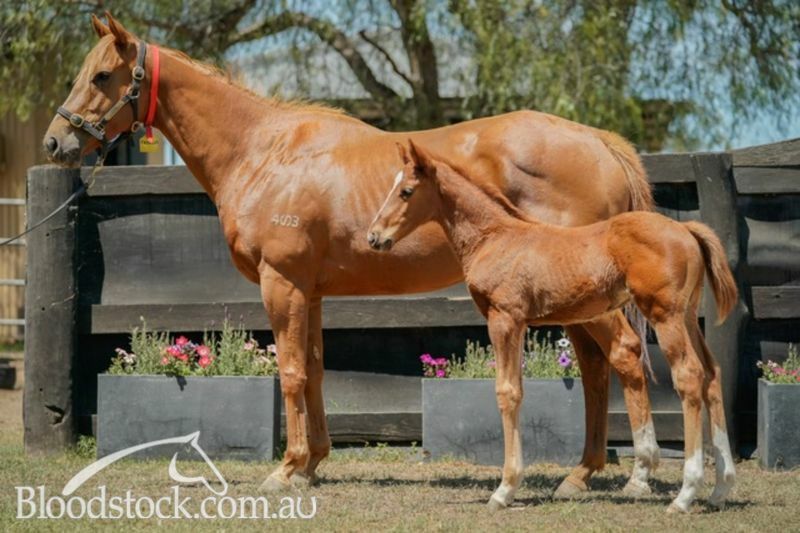 Feorela has a chestnut colt foal at foot by Melbourne Cup winner, Americain. Americain yearlings have sold at an average of $44,000 with the top priced colt making $175,000. 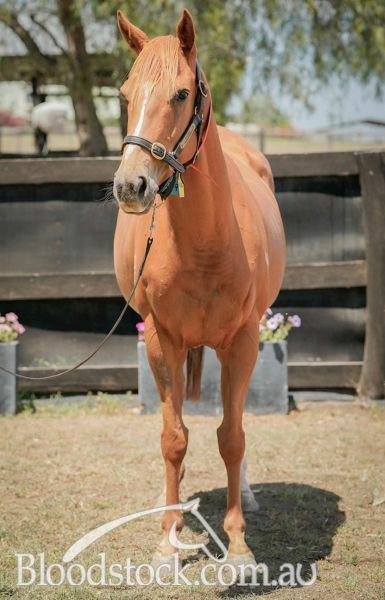 WANTED (AUS) (Bay 2006-Stud 2010). 3 wins-2 at 2, VRC Newmarket H., Gr.1. Sire of 255 rnrs, 148 wnrs, inc. SW Leicester - Helene Leadingstar (H.K.) (South Australian Derby, Gr.1), Mister Yeoh, Dead or Alive, SP Wazzenme, Sort After, Butch Kissidy - Unselfish Trust (Mac. ), Mystified, Badcoe, Surf Seeker - Sun Seeker (Sing. ), Rough Justice, Shaf, War Point and of Retosona, Salubrious, Wanted Diva, Sharpness, Want to Rock, Ash Grey, Kalabek, etc. 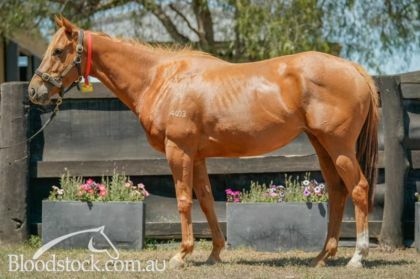 Extend (g by Catbird) 5 wins from 1200m to 2050m, A$154,970, VRC Divinyls H., MVRC Great Recycling Revolution H., 2d Werribee Cup, L, 3d MRC Magari H.
Ribera del Duero (g by High Chaparral (Ire)) 6 wins to 1400m to 2017-18 in Aust. Global (g by Reset) 4 wins to 1450m in Aust. Metro Cat (g by Tale of the Cat (USA)) Winner at 1200m in Aust. Isca Augusta (f by Smart Missile) Placed at 2 in 2017-18 in Aust. DAYLAMI (c Doyoun) Horse of the Year in Europe in 1999. Head of The 1999 International 4YO+ Classification. Champion 3YO Miler in France in 1997. Champion Older Male in GB in 1998 & 1999 (Int./Long). Champion Older Male in Ireland in 1999 (Int.). Champion Turf Male in USA in 1999. 11 wins-2 at 2-from 1600m to 2400m, £1,201,097, 2,190,000fr., US$2,280,000, 552,000Dhs, Ascot King George VI & Queen Elizabeth Diamond S., Gr.1, Breeders' Cup Turf S., Gr.1, Belmont Man o' War S., Gr.1, Epsom Coronation Cup, Gr.1, Longchamp Poule d'Essai des Poulains, Gr.1, Sandown Eclipse S., Gr.1, Irish Champion S., Gr.1, Curragh Tattersalls Gold Cup, Gr.2, Longchamp Prix de Fontainebleau, Gr.3, Evry Prix Herod, L, 2d Curragh Tattersalls Gold Cup, Gr.1, Deauville Prix Jacques Le Marois, Gr.1, Criterium de Saint-Cloud, Gr.1, 3d Newmarket Champion S., Gr.1, Royal Ascot St James's Palace S., Gr.1, Prix du Moulin de Longchamp, Gr.1, Royal Ascot Prince of Wales's S., Gr.2. Sire. DALAKHANI (c Darshaan) Horse of the Year & Champion 3YO in Europe in 2003. Champion 3YO Stayer in France in 2003. 8 wins-3 at 2-from 1400m to 2400m, €2,180,803, Longchamp Prix de l'Arc de Triomphe, Gr.1, Chantilly Prix du Jockey Club, Gr.1, Saint-Cloud Criterium International, Gr.1, Longchamp Prix Lupin, Gr.1, Prix Niel, Gr.2, Prix Greffulhe, Gr.2, Prix des Chenes, Gr.3, Deauville Prix du Pre d'Auge, 2d Irish Derby, Gr.1. Successful sire. DALGHAR (c Anabaa) 4 wins-1 at 2-from 1400m to 1600m, £49,931, €179,300, Longchamp Prix du Palais-Royal, Gr.3, Deauville Prix Luthier, L, Longchamp Prix de la Roseraie, 2d Ascot Diadem S., Gr.2, Criterium de Maisons-Laffitte, Gr.2, Longchamp Prix du Pin, Gr.3, Prix de Montretout, L, 3d Goodwood Lennox S., Gr.2, Maisons-Laffitte Prix de Seine-et-Oise, Gr.3. Sire. DAYMARTI (g Caerleon) 6 wins at 2000m, 2300m, 483,000fr., S$350,217, Le Lion-d'Angers Grand Prix d'Anjou-Bretagne, L, Singapore TC Three Rings Trophy, Class 1 H.-3 times, 2d Longchamp Prix Lupin, Gr.1, 3d Criterium de Saint-Cloud, Gr.1, Longchamp Prix de Conde, Gr.3, Singapore TC Chairman's Trophy. DALKALA (f Giant's Causeway) Champion Older Female in France in 2013 (Int.). 6 wins-1 at 2-from 1800m to 2500m, £85,118, €527,135, Longchamp Prix de l'Opera, Gr.1, Prix de Royallieu, Gr.2, York Middleton S., Gr.2, Saint-Cloud Prix Cléopâtre, Gr.3, Longchamp Prix de la Flandrie, Prix de la Chapelle, 3d Deauville Prix Jean Romanet, Gr.1, Prix de Pomone, Gr.2, 4th Ascot British Champions Fillies' & Mares' S., Gr.1, Longchamp Prix d'Harcourt, Gr.2. DOLNIYA (f Azamour) Champion Older Female in UAE in 2015 (Long). 5 wins from 1900m to 2500m, £80,625, €396,125, 13,212,000Dhs in France and U.A.E, Meydan Dubai Sheema Classic, Gr.1, Saint-Cloud Prix de Malleret, Gr.2, Compiegne Prix Melisande, L, Chantilly Prix Darshaan, Maisons-Laffitte Prix du Mesnil le Roi, 2d Epsom Coronation Cup, Gr.1, Chantilly Prix du Talweg, 3d Longchamp Prix Vermeille, Gr.1, Grand Prix de Saint-Cloud, Gr.1, 4th Longchamp Prix Foy, Gr.2. DALWARI (g More Than Ready) 4 wins-1 at 2-at 1600m, 1800m, Chantilly Prix de Guiche, Gr.3, Prix du Rond du Chene, HKJC Chongqing H., Yip Fat H., 3d Maisons-Laffitte Prix Eugene Adam, Gr.2, Longchamp Prix du Pre Catelan. ORATORIO LATINO (c Oratorio) 5 wins-1 at 2-from 1600m to 2000m in France, Italy and Switzerland, Milan Premio Bereguardo, L, Frauenfeld Frühjahrspreis der Dreijährigen, Milan Premio Sirmione, 2d Swiss 2000 Guineas, Milan Premio Quadronno, 3d Milan Premio Bereguardo, L, 4th Milan Premio Emanuele Filiberto, L.
ACES AGAIN (g Ghostzapper) 6 wins-1 at 2-from 6½f to 8½f, Northlands Park Harvest Gold P, L-twice, 2d Northlands Park Harvest Gold P., L, Spangled Jimmy H., L, 3d Northlands Park Westerner H., L, 4th Northlands Park Westerner H., L, Spangled Jimmy H., L.
Served by Americain. Date of last service, 26.09.2017.